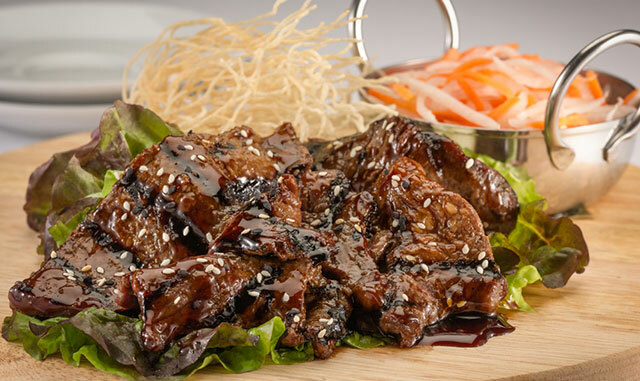 Just in time for your Labor Day BBQ, TAMO Bistro & Bar Chef Robert Tobin shares his Korean BBQ recipe! It serves 4 ~ enjoy! Mix all ingredients together in a bowl and set aside until it’s time to marinade the short ribs. Toss together carrot and daikon with 2 Tbsp. salt and 4 Tbsp. sugar. Let the mixture sit for 20 min, rinsed with cold water and drain. Set aside. Combine sugar, salt, vinegar and warm water to dissolve the sugar. Add the liquid mixture into the carrot and daikon mixture for 1 hour and it will be ready to use. To cook the dried vermicelli, place a heavy gauged pot on the stove with salad oil. Heat the oil until a test piece of the noodles puffs immediately. Dip the bundle of noodles into the pot and submerge in the oil, flip it over to make sure all the noodles puff and set aside. Marinate the short ribs for 6 – 8 hours in the refrigerator. Remove and grill immediately over medium to high heat, turning a few times until medium rare. To serve, place red leaf lettuce on the plate followed by short ribs on top. Vermicelli can be added next to the short ribs, along with pickled daikon.